Frank Lampard's fresh journey as a manager is something that the footballing world is looking at with keen interest. The former Chelsea player and Premier League legend etched his name in football folklore over the course of his time at Stamford Bridge. The Derby County manager is now focussed on getting Derby County back in the Premier League. 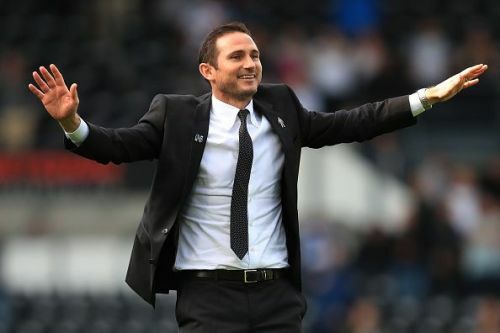 Lampard landed Mason Mount and Fikayo Tomori on loan from Chelsea this summer to bolster his squad but has now revealed whom he desperately wanted at his club this summer. It's none other than the 17-year-old Ethan Ampadu. The youngster joined from Exeter City last season and featured 7 times while Antonio Conte was in charge of Chelsea. Ampadu's exploits were quite impressive for a player his age and he was given his first international start for Wales last week in their 4-1 win in the UEFA Nations League over the Republic of Ireland. Ampadu impressed once again and the Chelsea fans are urging Maurizio Sarri to give the youngster more chances. Lampard, speaking to Derby Telegraph, revealed that he was desperate to lure Ampadu to Derby County. "I looked at him (Ampadu). I spoke to the (Chelsea) manager and he told me he wants him in their squad, so it was a very short conversation." "I shed a tear when he played so well! "I know him, and similar to Mason Mount, he is a young player with real ability and a fantastic attitude." Will Ethan Ampadu stay with the Blues or will he be shipped off like so many youngsters have been over the past few years? Only time will tell.